Interpal, a British charity providing development and relief for Palestinians in the West Bank and Gaza strip, has been served notification from the Islamic Bank of Britain that the charity’s account will soon be closed. This comes as a result of Lloyds TSB, the Islamic Bank’s clearing bank serving notice to “cease all dealings with Interpal”, according to a statement released by the charity. The notice comes into effect as of eighth December, during the Muslim festival of Eid-ul-Adha, a time when Muslims are encouraged to give charity. The decision to close Interpal accounts comes at a time when the United Nations agency assisting Palestinian refugees was forced to suspend food distribution, earlier this week, due to Israel’s continued border closures in Gaza preventing the delivery of vital supplies to Gaza’s 1.5 million residents. “Fuel pipelines remained closed, leaving Gaza with continued disruptions to its power supplies and adding to the rapid decline of socio-economic conditions” according to the United Nations Special Coordinator for the Middle East peace process. In September this year a World Bank report warned that the continued restrictions placed on the Palestinians by Israel was severely limiting the Palestinian economy and making Palestinians even more dependent on foreign aid. When approached the Islamic Bank of Britain said that it would “not comment on individual accounts” and Lloyds TSB offered a similar response stating “we do not comment on our relationship with corporate customers”. Muslim groups responded with anger. The Muslim public affairs committee (MPACUK) said “Lloyds TSB have shown how much they value their Muslim customers by demanding that IBB terminate Interpal’s banking facilities” and encouraged people to write and phone Lloyds TSB demanding that they “rescind this outrageous, unfair and arbitrary decision”. The Muslim Council of Britain, a national representative umbrella organisation, said they had written to Lloyds TSB saying the decision was “causing the MCB and the Muslim community tremendous concern and anxiety” and added that they “deplore the pressure that has been placed on IBB to close down the Interpal account”. The MCB also sent out a warning to Lloyds TSB referring to the “significant number of Muslim account holders” the bank possesses and the fact that Lloyds TSB has been “reaching out for business for its shariah compliant current account” adding “If banking services to Interpal are not reinstated, then this will inevitably influence the actions of its existing and future customer base”. However MCB refrained from stating exactly what action they would take in the event of Interpal’s account being closed. Interpal has faced numerous accusations since it was established in 1994. In 2003 the US government designated Interpal a terrorist entity, accusing the charity of funding the Palestinian group HAMAS. However the UK charity commission found no links to terrorism stating “The American authorities were unable to provide evidence to support their allegations”. In 2007 NATWEST closed the charities account citing pressure from the law suit bought by 14 families of Israeli suicide bomb victims. The claim was bought against the Royal Bank of Scotland, NATWEST’s parent group, under the US Anti-Terrorism Act. As I walk through the hand crafted wooden doors of the sixteenth century Naqshabandia Tajkia (spiritual centre) mosque that sits on one of the many hills surrounding Sarajevo, I am greeted by sounds of ambient, mellow chanting emanating from inside the Mosque. As I approach the sounds define themselves as voices singing in unison.Water trickles from the beautiful white and grey marble fountain which is topped with a bright white sphere that turns with the water flow. 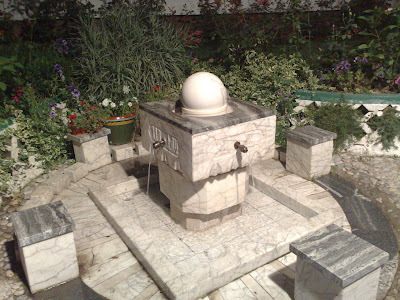 The fountain is placed in the middle of a neatly kept garden surrounded with numerous flowers. Large roses lean over the path to the mosque, like welcoming hands beckoning guests ever inwards. A small cemetery of old graves surmounted by traditional white turban tops, lies adjacent to the mosque. Cutting through an elevated prayer space, a massive wooden door takes us to the central area of the mosque, surfaced with wood, covered in traditional Bosnian rugs placed any which way in a riot of colour. The wooden praying platform is like a balcony allowing you to look out onto the small garden and cemetery.Inside the central prayer area, a group of men wearing green waistcoats and red fez hats sit, now silently waiting after the chanting. It is almost time for prayer. A man walks in as the muezzin (prayer caller) gives the call to prayer. Wearing a green turban and a long green coat, reaching just above his ankles, he glides into the mosque. Smiling softly with a look that permeates authority. Men around him react quickly; placing their right hands on their hearts, a salute to the general of an army. His green eyes acknowledge everyone in the congregation. After the prayer the man gets up and says loudly “Assalamualaikum!” turns and leaves just as he had entered, with long subtle silent steps. The congregation again place hand to heart. Who is this man? Leaving the mosque we are told by a man wearing a red fez hat and green waistcoat that the Sheikh invites us to return for a gathering later in the evening. Inside the sheikh sits amongst his students imparting knowledge and wisdom, exhorting them to be honest people and good. There is something different yet intangible about the relationship between Sheikh and congregation. Sessions of dhikr (singing praises of God) are tightly regimented; the circle formed by the murids (students) is disciplined into perfection. Late entrants must wait until granted permission to participate in the rhythmic undulations. “La il-la-ha il-allah” swaying left to right. – There is no God but Allah. Lights dimmed. Everyone deep in his own on themselves. The undulating dhikr movements over, a few announcements for future sessions, lessons and meetings are read out to the students. I catch a glimpse of the Sheikh in a room attached to the mosque. He beckons to me to approach. 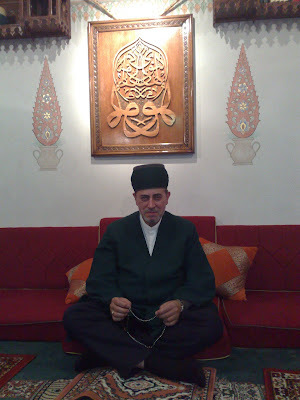 Sheikh Halil Hulusi Nakeshibendi el Bosnevi sits sedately austere surrounded by his students. Accompanied by numerous servings of tea our conversation commences. Sheikh Hulusi was the general of the Muslim Brigade, commanding over 5,000 men. “I have responsibilities as a sheikh. One of those is to fight in the defense of our community and country and people. This was incumbent on me”. He speaks softly yet authoritatively.Students move around punctiliously never turning their backs on the sheikh, walking backwards through doors as they leave, never sitting themselves higher than the sheikh, always hanging on his every single word, eyes fixated on either his mouth or on the decorated carpet, unflinching, intent.Sheikh Halusi was based in Zanista outside Sarajevo during the war. He relates how gatherings of dhikr preceded each operation. Spiritual guidance was an integral part of his leadership as he lead his men into battle throughout the war. During the war Serb forces destroyed mosques across Bosnia, wiping away history and those numerous architectural gems and ancient Turkish architecture, that made so much of the character of the country. Sheikh Hulusi was involved in the construction of the only mosque during the war built in a mountain primarily servicing fighters. Since the end of the war Sheikh Hulusi went back to his spiritual duties, teaching his students and leading dhikr gatherings. Tajkie are established in 17 different locations across Bosnia and two in America, all under the Sheikh’s guidance, he is keen to tell me, naming all the tajkie along with the names of the students in charge of each one. This is a growing movement that has been established since the 16th century in Bosnia when the Turks first came to the region. The Naqshabandia Mosque in Sarajevo was destroyed during Tito’s communist reign to be used as a storage depot. Sheikh Hulusi and his followers restored the mosque, succeeding even to restore the sixteenth century minbar (pulpit). Breaking a taboo of Sufi gatherings across the world I bring up issues of politics. I ask the sheikh about the current state of Bosnia and his opinions of the status quo after the war. My question does not seem to trouble him . “Bosnia is far from perfect,” he says thoughtfully sipping from a glass of dark red tea, “but look at the goals of the Serbs” he says darkly. “We saved Bosnia as a state. The term ‘Bosniak’ became a recognised form of self-identification. “Subsequent to the Dayton agreement, people that had fought against Bosnia are now in the government, working against Bosnia” These words are echoed by many others, including politicians such as the current president of Bosnia, Haris Silajdžić. Sheikh Hulusi says “The best future plan for Bosnia is to join the European Union, it’s the only way to stop future genocides”. Students discuss all manner of issues with the Sheikh, spiritual, political, aesthetic. 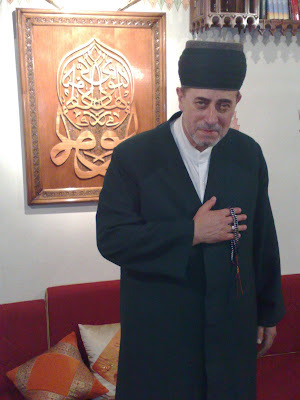 I suggest to Sheikh Hulusi that he is a different kind of Sufi Sheikh compared to other sheikhs. He disagrees and says that he is a true Sheikh. Other Sheikhs also stood up against oppression and occupation: Shamil Daghestani of the Caucasus and Omar Mukhtar of Libya: Both were spiritual leaders that led a resistance movement for freedom against tyranny: the Russian Tzar and Mussolini respectively.